This post was originally published on July 5, 2011. It was substantially revised and re-posted on February 2, 2015. Move over, Lily. This is the hottest flower name of the moment. Thanks to Heather for suggesting Violet as our Baby of the Name. This name is a shape-shifter. Like Lily and Rose, Violet is sweetly antique. But that vibrant V and bright ‘o’ coupled with an -et ending lend this name a completely modern sound. Back to the flower: violet is iole in Greek and viola in Latin. It became viole in French, and then violette. 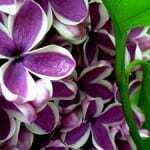 The plant isn’t always purple, but since the fourteenth century, violet has applied to the color as well as the flower. It has a long history of use as a given name, tracing back to the Middle Ages. Born Helen, but known by her middle name Violet, the Baroness Asquith was the daughter of a prime minister, a close confidante of Winston Churchill, and grandmother to actress Helena Bonham Carter. Daisy and Violet Hilton were conjoined twins, and famous vaudeville performers in the 1930s. Violet Wilkey was a child star in the silent film era, appearing in dozens of films between 1913 and 1917, retiring at the age of fifteen. The name was a Top 100 choice in the US through the 1920s, and remained in the Top 200 through the 1930s. One of the orphans in the long-running series The Boxcar Children, originally published in the 1920s. Champion gum chewer Violet Beauregard wins a golden ticket to tour Willy Wonka’s Chocolate Factory along with Charlie Buckett, only to end up as a giant blueberry. Violet Baudelaire is older sister to Klaus and Sunny in A Series of Unfortunate Events. Pixar’s The Incredibles introduced a family of superheroes in hiding. Firstborn Violet is a shy teenager who really can become invisible – a play on the phrase “shrinking violet” – used to refer to one who is timid. It was also the name of Screech’s girlfriend on early 90s television hit Saved By the Bell – played by a young Tori Spelling. Lest you think this name lacks an edge, there’s also Milla Jovovich’s turn as sci-fi warrior Violet Song in 2006’s Ultraviolet. No wonder that Violet had reached #122 by 2010. Then came Violet, the Dowager Countess of Grantham, on Downton Abbey, played by the scene-stealing Maggie Smith. Downton debuted in early 2011 on PBS in the US and became a sensation. In 2012, the name re-entered the US Top 100 at #89. Ben Affleck and Jennifer Garner’s firstborn, Violet Anne, arrived in 2005. Foo Fighters’ frontman Dave Grohl and wife Jordyn Blum gave the name to their daughter in 2006. Then came Dixie Chicks’ Emily Robison and actress Poppy Montgomery. Most recently, credible rumors suggest that this is the name chosen by actors Blake Lively and Ryan Reynolds for their late 2014 arrival. With all of these powerful associations, the lovely Violet is no longer rare. The name ranked #69 in 2013, and seems poised to climb higher still. But will this name crack the US Top Ten? It’s too early to say, but right about now, Violet is definitely a name to watch. What do you think of Violet? Is this name perfect, despite being increasingly popular? Or do you think it’s too common to consider? Note: Violet is also the birth flower of February, and the liturgical color of Advent and Lent. I like Violet but we already have an Ivy, our only child. I wonder if Ivy sounds far too similar to Violet and especially to the nicknames “V” or “Vi” that I would be tempted to give her. Violet is also the name of a Vampire Slayer played by Felicia Day on Buffy The Vampire Slayer. She went by Vi. Our little girl is Violette Ellis, we went for the French spelling as we have a very short and boring last name. Everyday someone comments on how pretty or how ‘strong’ the name is. We call her V as a nickname, her grandparents call her Letty and she calls herself Viley (!!!). I gave birth 2 months ago to a gorgeous little girl named Violet May. My husband was not keen on the name throughout the pregnancy but 1 minute after she was born he announced our first born was to be named Violet. 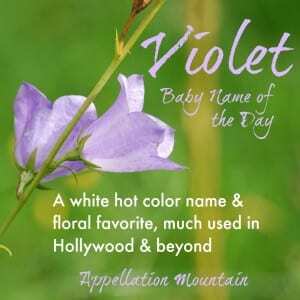 Ive liked the name for the last few years( as well as Charlotte & Scarlett) I do like that Violet is a classic name and it is feminine, it represents a colour and a beautiful little flower. It isnt a modern, made up name nor has ridiculous spelling. We have been calling her Lettie since she was 2days old. That should’ve said “not”, not “nit”. Typing one-handed while the baby naps in my arms. Love it, Nit allowed to use it. :/ I do know of a Violet Rose IRL. I would’ve hesitated to use two floral/color names. my niece Violet is awesome! She’s 11. Violet is on our short list if we have another little girl. I love it! I really like Violet, and I’m sad it’s become trendy. Nice associations, too, and Lettie is an adorable nickname. Purple is my favorite color, so all the purple hued names (Violet, Lilac, Lavender, etc.) are on my list. I especially like Violet. It has the old-lady chic vibe that I really love, plus that favorite color feel and its a sweet name. I never thought of Letty as a nickname, but I really like it. I shall have to keep it in mind! I suppose this is a more evidence about how popular Violet was back in the day, but I too had a beloved Great-Aunt Violet. I always thought I’d have a daughter named Violet, but unfortunately, Violet Schw_____ sounds like violence, so the name doesn’t work for us. I adore meeting little Violets, because it’s such a exquisite name and the nickname Letty has such a spunky, tomboy quality. I forgot about Letty. Our little Jane Violet was almost named Violet Jane and if so, her mother planned to call her “Letty”. (Mom REALLY WANTED Jane, her closest sister’s middle name, for the first name; Dad was routing for Violet , a name from his family tree.) I’d never before come across Letty as a nn for Violet, so I did some online research and found that It has been used as such for a very long time. Combs, Violet “Lettie” Birth : ABT 1750 Loudoun Co., Va.
Adore Violet — I think it’s a shame it’s become so trendy, because it means I probably can’t use it. @Patricia — Jane Violet is lovely! I like Violet best as a middle name. As a first name, Violet seems a bit too dated and there’s that association with the word violent that I hear sometimes and also the nickname “Vi” to avoid. But as a middle, for me at least, Violet is the flower — always pretty, always current. We have a toddler girl in our family named Jane Violet – I love the way Violet adds flair to the classic Jane. I really like Violet, and I actually don’t know of a single one IRL. My grandmother’s given name was Violet, but she hated it! She always went by her middle name instead. My Aunt Violet was, hands down, my favorite Aunt. She wasn’t really Violet, that was what my Mom told us to call her. All my other cousins called her Auntie Val which baffled me as a kid, but I rolled with it. Come to find out, Violet’s name is actually Valeriana (or Valaria, depending on what you look at, document- wise). I still think of her as Violet, and I’ve got it in the middle to honor her in several combos on our list. I think it’s sweet & how better to honor the lady who treated me like the daughter she never had. Violet’s aces, no matter how popular she gets! I think Violet really does have an edge. One letter short of the word “violent” and sounding similar to “violate” makes this a rather dark name. It’s chaste and yet somehow also seductive, like a sweet old great-aunt who used to be a chorus girl. It’s dainty and alluring; it’s hip and punk; it’s gloomy and Gothic. As you say, it matches well with all kinds of siblings, and the T ending means it’s easier to find middle names for it than many other girl’s names (while also being good middle name material itself). I really like Violet. It sounds like it would last a lifetime, as nice for a baby girl as for the woman she’ll grow into. […] I agree with Zeffy – wait, that’s no surprise. […] of colors are fair game in the land of baby naming, from pretty botanicals like Rose and Violet to more masculine hues like Gray and Jet. […] royal palace in Honolulu is the ‘Iolani Palace. […] and Violet are in full bloom. […] But back to Azalea – she strikes me as unusual and a little bit showy, but still completely wearable. […] Heather was a logical choice for the cinematic trio.